Some of the largest e-commerce players derive 30-50% of the paid marketing transactions from Remarketing campaigns. Even in the Travel and Real Estate space, re-marketing has become one of the primary strategies on digital. How often have you gone to a airline flight booking portal with the intention of booking a flight between Kolkata and Mumbai from Jet Airways? 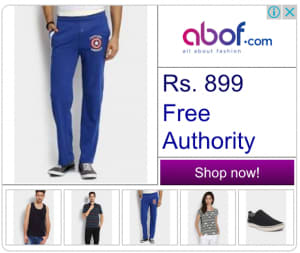 I am sure that a very customized ad giving you the same/best deal on the circuit must have excitedly followed you on other websites that you visited. Another example, when you go to a Fashion apparel website to buy a quirky red sheath dress, doesn’t the same dress get remarketed to you along with a catalog of similar products? Guess what? These same seemingly invasive ads have been one of the most remarkable stories in the Ad Technology solutions that Google has come up with in the last few years. Dynamic remarketing has become one of the key weapons in a digital marketer’s ammunition. The world of e-commerce in India is getting exceptionally competitive with the burgeoning number of heavyweights coming into picture. What becomes even harder is to get the bang for the right buck (and not the right bang for the buck), where the buck itself is dwindling. The CMOs of the world are under increasing pressure to enhance their marketing campaigns to get their ROI on track. DRM is a game changer if used in the right way. 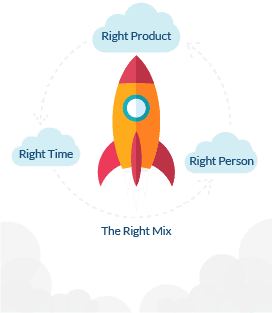 Dynamic remarketing works on the classic marketing philosophy of ‘Right Product for the right person at the right time’. Let’s go deeper into what this philosophy calmly postulates. Right Product: A consumer is more likely to buy a product in his re-visit if he has already shown consideration for the same in his previous visit. Thus, it makes sense to re-market to him the same products that he already has viewed but not purchased. Right Person: A product is more likely to be purchased by a consumer if he has added it to his Cart or Wishlist, as against a simple product detail view. Thus it makes sense to go aggressively after cart-abandoners or wish-list audience. Right Time : The purchase decision cycle of a consumer is very short in e-commerce. Thus it makes sense to go much more aggressively after people who have very recently shown interest in your product. A product is more likely to be purchased by a consumer if it has been viewed or added to cart recently. Dynamic Remarketing helps us to accomplish all the above 3 in a seamless manner thus proving itself as a key part of the performance marketing arsenal. While every business thrives on getting more and more new users to its website, without an effective remarketing setup, all the efforts in driving new traffic to the website will go in vain. DRM helps us to close the transaction loop which a particular display, paid search or social campaign starts. DRM, to say the least, the journey from a top of the funnel exploration phase to a purchase culminates with the Dynamic Remarketing campaign. 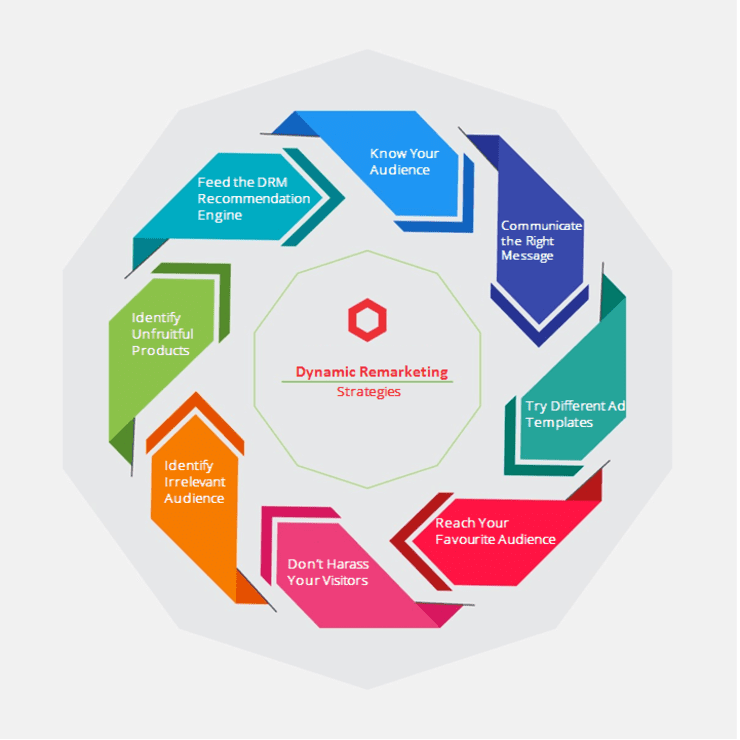 Let’s now take a look at eight most proven strategies of Dynamic Remarketing that you must use, to stay ahead of the competition! Understand that DRM is a very personalised way of marketing. It helps advertisers quickly reach their visitors via tailored product ads. Thus, it is very important to target the most recent and most interested visitors. Using recency and funnel-wise cohorts with differential bidding will help you assess the right audience to drive your growth. Are You Communicating the Right Message? A general site visitor, category page viewer, product viewer, cart abandoner and a past purchaser – all are in a different stage of the purchase journey. Identify whom you really want to target and accordingly craft the message based on the purpose. Include a call-to-action button and communicate any USP or offer on the website. If you are communicating a message for an ongoing sale, ensure that you have consistent messaging on the site. How Well Are You Playing with Ad Templates? Adwords provides a host of ad layouts to test and check which one is working best for you. A/B test your headline with various colours and text sizes. Some colours and sizes work well on Desktop, some better on Mobile. Get your pick right! Test your CTA button message across various colors. Change the button color to see if that causes an improvement in the CTRs. Change your background and see what color gives the best performance. If the existing ad layouts available in Adwords don’t excite you much, go out and unleash the power of Google Web designer to test out Interactive HTML5 creatives. While testing your ads ensure that you maintain continuity with your website design and include your brand logo. Dynamic remarketing acts as a branding mechanism as well. It gets your users to your website again and so including the brand logo/name helps the user realise that it’s an ad for the same website they have visited before. Are You Reaching Your Favourite Audience Adequately? The time taken to purchase in eCommerce is short. Hence, it is critical that your dynamic remarketing campaigns should not be impeded by reach. Not all sites support animated ad formats. Infact some sites don’t even support image ads. However, that shouldn’t stop you from reaching your potential customer. Ensure a comprehensive ad strategy by including ads in all sizes and all formats. Based on performance you can take a call whether to run a particular ad or not. But you surely don’t want to lose out on precious impressions for a cart abandoner without even experimenting much. Dynamic Responsive ads is an easy way to go all out on your potential GDN inventory. They adjust their size, appearance and format to fit in available ad spaces. While it is important to excitedly market to your visitors. Even more important is to not go overboard and over market to them. You don’t want to suffocate your users until they start hating you. Test out Impression caps on your visitors to find the elastic sweet spot. Bounced sessions, very low session times, no shopping behaviour carried – these are just some of the many cases that you may want to avoid spending money on via Dynamic remarketing. Identify your bottlenecks and weed out unqualified audience interactions. Why Only Unfruitful Audience? What About Unfruitful Products? Do you ensure that the product catalog being remarketed has enough inventory available in it? You would not want to re-market products which have depleted in the popularly bought size or color, would you? This is possibly the most spoken DRM strategy but very few are able to implement it successfully. If you haven’t played with remarketing custom params and product feed then you have potentially not harnessed the potential of the DRM recommendation engine. Enhance the feed to tailor your product recommendations based on a user’s product view. Generate secondary purchases and upsells for existing buyers. Decide which products to re-market based on your business margins. Remember that more than 90% people don’t purchase a product on their 1st visit. Hence an effective DRM strategy will go a long way in fulfilling your business goals. Test out what combinations work best for your business. A/B test your experiments and keep remarketing! A common question that advertisers ask me is how do I differentiate the strategy between a DRM and Static(standard banners) Display Remarketing campaigns. Since both are remarketing channels, wouldn’t they act as deterrents to each other if run in parallel. Here we need to understand the basic idea of Static Remarketing. Ad content Product Ads Sale or Category banners, Festive Offers, Fresh Arrivals etc. Creative messaging Personalized based on Site action like Cart Abandonment, Past Purchase via offer codes, sale preview etc. Personalized based on Category visited, new collections etc. Dynamic Remarketing is a very personalised channel and hence works effectively for more recent users who are closer to the funnel. Static remarketing on the other hand can be used to carry your marketing conversations with a larger user pool. Getting Purchasers from previous season sales. Reminding your most loyal customers about fresh arrivals or new/exclusive brand launches. For the customers that love your catalog, cross-sell them your best deals. If you think a certain red t-shirt goes well with a blue slim fit jeans, communicate the story. Following up on your Youtube video viewers (who haven’t visited your website) with the dynamic Lightbox catalog of fast-moving products. Reaching out to your intent based bounced audience differently. Reach your registered users with better messaging. There are a plethora of such strategies that advertisers should experiment with based on their objectives. It depends a lot on what you expect from the campaign! Keep experimenting. In case you want us to do a quick audit on why your remarketing isn’t giving you the right ROI, reach out to us on hi@onlinesales.ai or just say on our chat. I must say re-marketing as a digital weapon can be very potent as these ad-formats have additional information around user behavior on the site indicating consciously or subconsciously their intent. when this intent is combined with powerful Google ad-formats can deliver one of best digital channel ROIs. DRMs also helps break the clutter of mass marketing and gets into zone of personalized marketing and that is the direction towards which digital marketing is moving. Very true that dynamic remarketing is a very personalized way to drive your marketing conversations. No wonder that we are seeing increasing number of platforms providing support for dynamic ads. The more immersive the ad experience becomes, the greater will be the growth potential that Dynamic ads will bring to the business.